A/B Testing. You’ve heard the term in online marketing, but do you do it? Testing out variations of an ad campaign to increase sales and profits is still a mystery to many small businesses and marketers. Unlike more traditional advertising methods like TV, radio or print, in online marketing it’s really easy to make changes, test them out and increase your ROI. That includes making adjustments to optimize your Google AdWords Campaigns. If you’ve come from an offline advertising background, you may not even know that a few simple tests with your online advertising efforts can increase conversions - and your profits - by 5% to 500% or more. In this article, I’ll tell you what exactly A/B testing is, why you need it for your Google AdWords, and practical tips for you to optimize your own Ads. Most marketers (digital and old-school) know that connecting with your consumer is both an art and a science. You may have a good idea about what works creatively. But you need to test it out, and prove your marketing results with numbers. In a nutshell, A/B Testing is a way to determine what gets your Ads the best results. It’s testing out, for example, your Call-to-Action like “Buy This” and “Get Yours Now”, and then figuring out what your customers are positively responding to the most. The more positive a response, the higher your ROI. I’ve seen the smallest of changes bring companies increased revenue of 10% to 2,000%. That could be thousands of dollars for your business - at no extra Ad spendfor you. That’s the value of A/B Testing. A/B Testing is like a science experiment. Yeah, remember high school biology? Only now, you’re not testing the innards of a frog - you’re testing the innards of your Ads, and improving your results to bring in more money! You have group A (the control), and you have group B (the variation).Then you test and measure for the result you’re looking for (ie sales, profit, clickthrough, leads, etc). You then use the group that gives you the best results. Make two Ads in a Google Ad Group. Choose a variable to test (say your Headline). Set up your metrics to measure results (in this case sales conversions). Write two different variations (in this case, Headlines) in your two Ads. Name your Ads something like “Hln A” (the control) and “Hln B” (the variation). Run the Ads simultaneously, for a certain time, say, one week. Track your “A” and “B” results. Put your budget into to the Ad that brings in more sales. A/B Testing can be as simple (or as complex) as your business goals, time and resources allow. But, when even small changes in your AdWords can result in conversion increases of 50% or even 500%, it pays to get into the practise of A/B Testing your paid advertising. Before you jump in and start testing up a storm, you need to limit what you’re looking for. In a digital landscape, you can A/B Test for infinity. Focus on your goals, and profits will follow. For some marketers, who do this as their day job (and get into advanced methods like multivariate testing) it might be ok to test forever. But – if you’re a small business owner, or a practical marketer, and you’ve got millions of other profitable tasks to work on - you need to narrow your scope. 1. What’s the GOAL you want to improve? Choose a goal to achieve. You can even put numbers to it, like “generate 25% more leads within 2 weeks”. 2. How are you going to MEASURE your results? or even a third party tracking system like we give you at Wishpond. 3. What PART OF THE AD are you testing? Choose one Ad part to test, to make it simple. 4. What are the TWO VARIATIONS? Make the two Ads you’re going to run. Use “A” as your control Ad. Make the variation Ad as “B”. 5. How LONG will you run the test? Before you start, determine the length of the test. That way you’ll have a finite time to conclude, assess your results, and move on. 6. What RESULT do you need? Decide how much you need to improve your sales, leads, brand awareness and so on. 7. What ACTION will you take? If one Ad is doing way better than the other (like significantly better), then use that higher performing Ad. If there’s not much difference, will you keep running the test for a longer time, keep using both ads and stop the test, or try another A/B test with a new “Ad B”. Ok, now that you know about A/B testing, and your mise-en-place marketing is in order, let’s take a look at an actual A/B Test example. I’ll be using a client of ours (but inserting a different name), to show how easy it is to A/B test, and how it impacts your bottom line. The example is from a company in the party rental equipment business. Here are 3 tests we ran. You can easily do these too. Your headline is the first thing people tend to see in your text ad. We tested out different variations that would be relevant to the consumer and what they were searching, their keywords and their landing page offer. For the party rental company, their headline A reads: “Party Rental Equipment”. We changed the Ad headline to be more specific about their products. Our headline B variation reads: “Party Tent&Event Rentals”. We ran the test for one week, with keywords, targeting, budget and everything else the same. The Result: A 3% increase in clickthroughs to their website. As you know (if you’ve been reading my series on Google AdWords), you can change the website address in your Ad Copy. Test out if a change in your Display URL makes a difference to your advertising outcomes. We ran the test for one week, with no other changes to variables. The Result: An 11% increase in clickthroughs to their site. Your Calls-to-Action can motivate a customer to click your ad, book your service and buy your products. Test out your action asks to increase your conversions. In the same party rental ad, we changed the CTA of “book online today”. We tested it with: “Call us today”. The Result: 17% increase in website traffic. Yeah, this seemed like a strange result, considering the CTA was to call them, not visit their site. But, they don’t have their phone number on the Ad, and I surmise the “Call us” gives a more personal connection with the consumer. 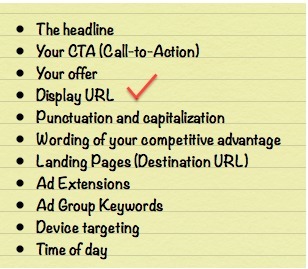 Given these strong results, we could test out other CTA’s, too. The best CTA’s are action oriented, short and inspire a quick response. 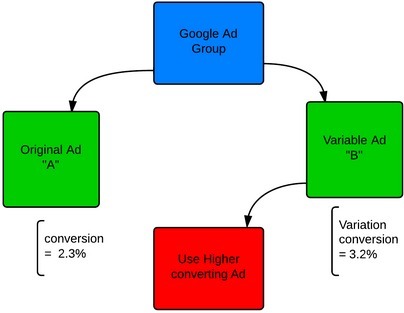 As you can see, there are many many variables you can test on your Google AdWords campaigns, Ad Groups and Ads. Each change can lead to exponentially increased returns on your advertising investment. You may be pleasantly surprised at how a few simple words can take your ad results from a 5% CTR to a 17% (or higher) CTR. A 5% increase to your CTR can increase profits by thousands. A/B Testing is effective. It works. Once you get used to it, it’s really not that hard to do. When you are A/B Testing, make sure you keep your end goals in mind. It’s about increasing your business ROI, and making your company more profitable without excess spending. Don’t get so drowned out by the testing details that you lose sight of why you started A/B Testing in the first place. Start by trying out one or two variables. Test. Improve your results. How Do I Optimize Keywords [and ROI] for My Small Business AdWords Campaigns?